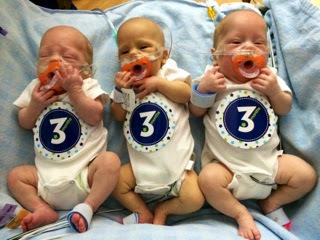 Happy 3 Month Birthday Babies! Do you ever have those days where you just feel proud? Proud of yourself, proud of your children, proud to be who you are and proud to have the life you have? Well I had one of those days today. It wasn’t the type of day you would expect though. I had a super busy day following a bunch of other super busy days (which included working on Saturday and Sunday). Today was the second day of a 2 day trial in Hot Springs. I got up very early, drove an hour to get to court, spent the whole day in court, then finally made it to the hospital to see my boys a little after 6 this evening. (I also fit into my skinny suit pants and wore a belt today for the first time since early on in my pregnancy!) I made it home just a few minutes ago (it’s 11 pm now as I’m starting to write this post). Needless to say I’m tired and exhausted. But when I finally sat down to write about this week (and to pump of course) I realized that I’m full of pride. These last 3 months have been extremely hard and it’s taken a toll on me and Brian. But when I look back at how far we’ve come in just 3 months, I’m amazed. And proud. And so thankful that God chose me for this life and these challenges. And thankful that Brian is here to go through it with me and help me through it. I know there’s no way I could do this without him! He’s a lifesaver really! To celebrate 3 months, I staged a reunion for the boys. And a photo shoot of course. Brian pulled mom duty because I’ve been working so much and got the month stickers. We missed 1 month and 2 months. But we’ll get the rest of them! And in case you’re wondering, we got the stickers at Babies R Us. 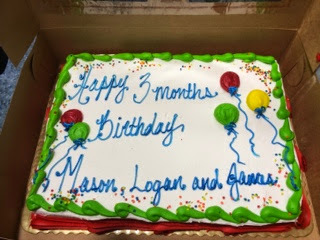 We also brought cake to the hospital for the nurses, doctors, and everyone else who has helped us and taken care of the boys. Dr. Peeples strongly hinted that we should bring cake the other day. Because we like her (and because it was a good idea), we did it. Mason: 6 lbs. 5 oz. Logan: 5 lbs. 14 oz. James: 7 lbs. 1 oz. 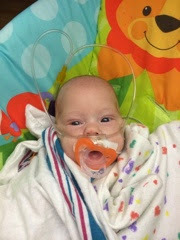 Mason is doing great this week. 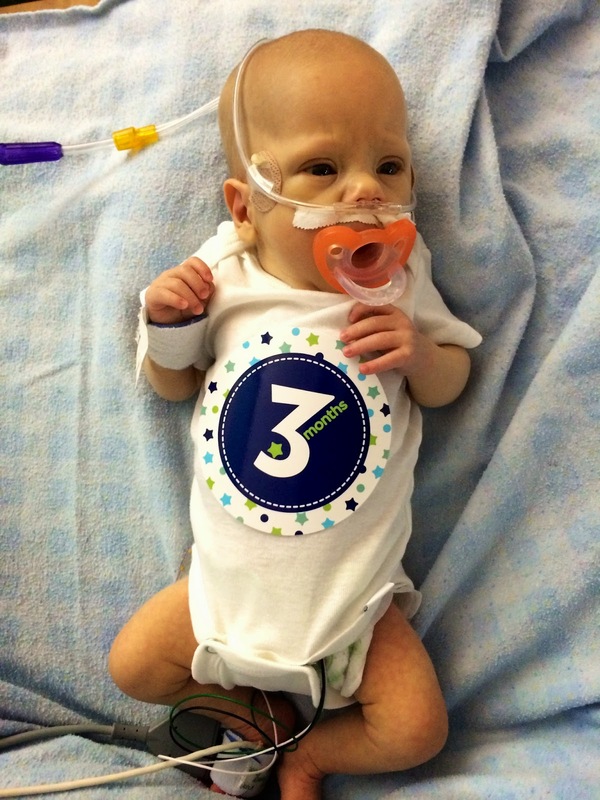 Last week Dr. Peeples put him back on 2 liters of oxygen and stopped oral feeds because his co2 was high on Monday (a step backwards). But she slowly weaned his oxygen over the week. As of today, he’s back down to 1 liter and we restarted oral feeds yesterday. Right now he gets 1 per day so I’m doing breastfeeding for him that 1 time. He’s done great so far. Better than before actually. If his gas is good again on Thursday, we will probably increase his oral feeds. Mason is usually the most alert of the 3 boys. You can’t tell that from the group picture though! 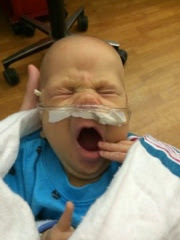 Mason was the cranky uncooperative baby for the photos today! Totally opposite of his normal laid back attitude! 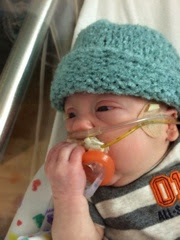 Logan is planning his departure from the NICU! That’s right! 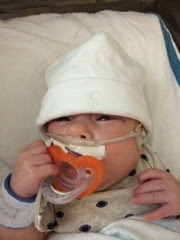 He was the sickest at one point (for a while actually) and now it’s looking like he may get to go home first! Hopefully without oxygen too! He got an echo of his heart done last week and the results came back normal! That means that he can come off oxygen completely if he’s ready! Right now he’s on 1/2 liter. I hope he can get off completely though. Go Logan! Logan has been a feeding machine this week too! 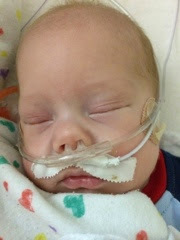 He’s on the oral feeding pathway (he started this last week I believe) and he’s just moving right along. 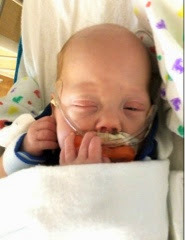 He has to take 75% of his oral feeds, continue gaining weight, and not show signs of distress during feeds at each step for 2 days before he can move to the next step. Well he’s moving up every 2 days it seems. 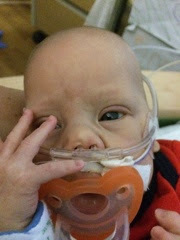 Right now he’s on “milestone C” which is 6 feeds by mouth per day. I fed him 2 bottles today and he did great both times for me! My goal is to breastfeed each baby 2 times per day but because I was only at the hospital for 1 feed today, I let Mason breastfeed that time because he needs more work. I’ll be there for Logan in the morning though! Isn’t he adorable?! And photogenic too! He seems to be the easiest to get photos of! James is like a normal newborn now! He’s over 7 pounds! He seems HUGE compared to Logan! Mr. James had a big week! 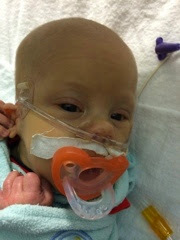 He is now on 1/2 liter oxygen! Wow! This is a big change for him. Yesterday they went from 2 liters down to 1/2 liter (skipping several steps). He’s doing great so far. No desats (low oxygen saturation) or bradys (low heart rate). I think he likes the less intrusive flow. 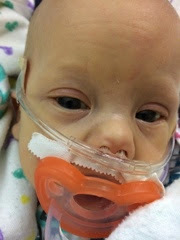 And once they get down to 1 liter the cannula isn’t heated anyone, which means no water up his nose (when the cannula is heated, condensation builds up in the tube and inevitably goes up their nose). 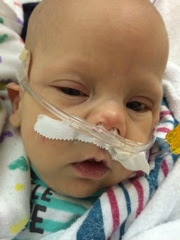 James is also progressing well with his feeds. Right now he’s back on a 3 hour schedule. 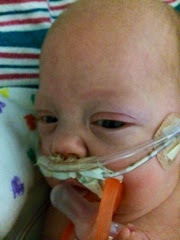 He’s not quite on gravity feeds (where they just hang a tube with his feed every 3 hours) but he’s getting close. He’s currently getting his feeds every 3 hours over the pump for an hour. 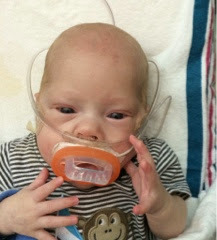 Depending on his gas on Thursday, James may be able to start oral feeds later this week! I’m so exited! 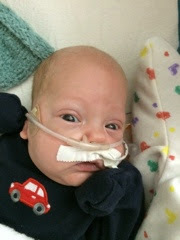 James also started taking Prilosec this week for his reflux. It seems to be helping! He’s way calmer. As promised, I took more pictures of James this week. He’s actually not supposed to sleep on his belly anymore so it should get easier. 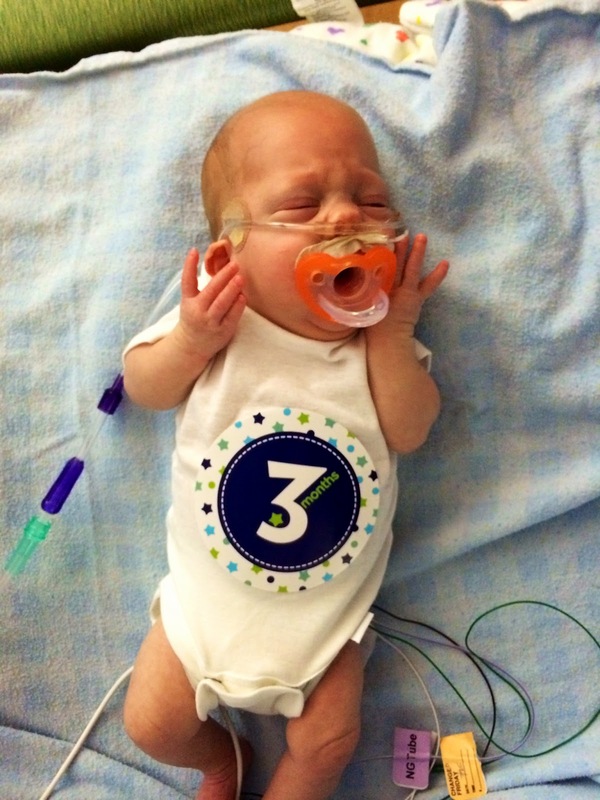 James was actually the most cooperative for the 3 month photo shoot tonight! Anyone who knows James will be surprised! But I think he loves his brothers. He tends to calm down when he is with them. So sweet! 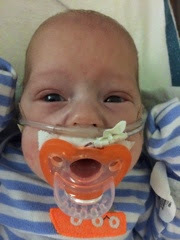 In case you can’t tell from the photos, all 3 boys LOVE their pacis! We have follow up eye exams tomorrow (Wednesday) so please keep us in your thoughts and prayers. Think normal results! I’m pretty nervous about it but I’m staying hopeful. Thanks so much! 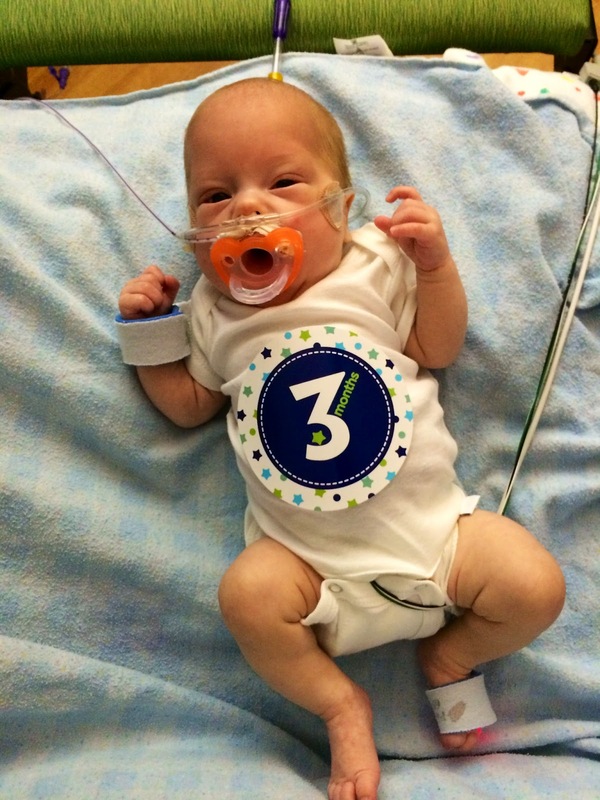 This entry was posted in Birthday, Family, NICU, Triplet Milestones by Angela Mann. Bookmark the permalink.